Star Trek: The Motion Picture came out in 1979 and despite tepid reviews that called it boring (it kind of was) the film made enough money that Paramount wanted to make a follow up film that could capitalize on the science fiction zeitgeist that had been kicked off by 1977’s Star Wars and Close Encounters of the Third Kind. What Paramount wanted was an action oriented film that would cost less than the bloated film’s previous budget, what they didn’t want was another existential search for the meaning of life and the value of sentience. To facilitate a cheaper, tighter, more film friendly ethos: Gene Rodenberry was out and replaced with Paramount TV Executive Harve Bennett who brought on writer/director Nicholas Meyer to deliver a Star Trek film to match Paramount’s expectations. Horner was asked to turn in a score that was stylistically different from what Goldsmith had done for The Motion Picture, and he more than delivered on that promise. Goldsmith’s score for the first film was a sweeping romantic piece that was built around a central motif for “The Enterprise,” which is a beautifully bombastic march that most of us have come to know as the opening theme for Star Trek: The Next Generation. Goldsmith’s Star Trek begins with a bold horn that announces itself and marches the now familiar TNG theme, but Horner’s Star Trek begins with a mysterious sustained synth note and a low thrumming base riff over which he plays a re-orchestration of Alexander Courage’s theme from Star Trek The Original Series before beginning the Main Title credit sequence. Marrying the first few notes of the classic theme to the beginning of the film’s Main Title works so well in this film that it becomes a staple of Star Trek scores, and allows for those few notes to become the connective tissue of any piece of Star Trek music. The Main Title that follows over the opening credits of the film is a compilation piece that introduces us to the thematic motifs of Captain Kirk, The Enterprise and Mr. Spock before the music fades out leaving only the mysterious sustained synthesizer and bass riff. Horner establishes early in the film that his score will deal with two equal and opposite aural landscapes as we move throughout Khan’s quest to revenge himself on James T. Kirk; there is an auditory palate for Kirk and the crew of the Enterprise that employs low militaristic timpani drums beneath lyrical strings and sweeping majestic horns. There is also an auditory palate for Khan and his crew of genetically engineered supermen that uses heavy percussive instruments and rich violent horns. We are introduced to this duality of scoring when Chekhov and Captain Terrell beam down to Ceti Alpha V to investigate the pod, as they enter the remains of Khan’s ship the benign strings that have followed them to the planet surface are suddenly undercut by a sustained synth note that gives way to long sustained horn notes and slow rhythmic percussion that builds and builds until finally Khan and his followers appear as shadows in the dust accompanied by screeching and threatening horns. The entire scene gives the impression of a predatory animal suddenly woken and getting closer until it finally has you in its clutches. The bombastic strings and regal horns of the Enterprise theme return with another restatement of the Courage motif as Admiral Kirk and his crew board the Enterprise for their training cruise, here is where Horner delivers the nautical feeling Nicholas Meyer asked for as The Enterprise powers up and sets out on its journey full of hope and promise, it is also in this piece that Horner shows us that the motif introduced early in the film for Kirk is a half formed piece that needs the Enterprise motif to make it whole. After receiving a mysterious message from the scientists of Regula I, Kirk goes down to speak with Spock about taking command of the ship and we are given the full statement of Spock’s theme which begins with the mysterious synth notes from the beginning of the film before falling into an almost eerie panpipe statement that plays as a dark foreshadow of things to come. The following section of the film blends the Spock motif and finally states the Kirk motif and the Enterprise motif as one entire piece as Admiral Kirk takes command of the Enterprise and orders Sulu to change course. Finally the two starships; Kirks’s beloved Enterprise and Khan’s stolen Reliant arrive for their face off in a piece that begins with screeching horns and wild drums symbolizing Khan that give way to the structure and ordered rhythms of Kirk and the Enterprise. The moment the two characters share the same space in the film Horner starts a repeated bass note that acts as the seconds of a countdown clock over which every single moment of music will play from now until the Reliant and Enterprise limp away from each other. Horner masterfully executes a sort of dance between the two motifs and styles where one moment Khan’s motif will have the upperhand and the next Kirk’s will. The two trade of control of the composition just as they trade torpedoes back and forth until finally it is Khan’s screeching violent horns that win out, but this time it is not the chaotic drums of his motif serving as the backing rhythm to his horns. Rather the ordered military march of Kirk’s motif that plays beneath Khan’s music and builds into the next phase of this main battle. As Khan believes he has bested Kirk, the Kirk theme grows more powerful and less frantic as Kirk goes about enacting his plan to save his ship and crew until finally the Enterprise motif has re-emerged as the dominant piece of music. Kirk’s superior knowledge has given him the upper hand and the Khan motif spirals out of control faster and faster as Khan tries and fails to raise shields before Enterprise can fire. Finally Kirk strikes at Khan triumphantly and - with the Enterprise motif vastly overpowering the Khan motif – the Reliant limps away. Shifting gears to the mysterious “Genesis device” and the team that created it Horner introduces a new motif when the Enterprise crew beams down to Regula One, it is a slow mysterious string melody that plays alongside the eerily shrieking horns and drum stings as Kirk, McCoy and Saavik explore the now abandoned space station before beaming into the asteroid and teeing up the next encounter between Kirk and Khan. Khan’s chaotic motifs and Kirk’s ordered motifs clash once more as Paul Winfield’s Captain Terrell is ordered by Khan to kill Admiral Kirk and attempts to fight his programming; even though duty, honor and James T. Kirk win out in the mind of Terrell – the score is epitomized by Khan’s motifs as he lords it over Kirk that he has been marooned for all eternity on the rock that is Regula I. Khan has won this battle and Horner’s score informs us of this just seconds before Kirk does the same with his infamous scream of “KHAN.” Now trapped with the Genesis team, Kirk and company have time to sit and talk. Horner takes that slow mysterious string motif and gives it a full throated lilting reveal, but as a half formed 45 seconds this new mystery motif for Genesis feels as if it is missing something. Kirk reveals he and Spock had a trick up their sleeve to get Kirk and crew off of the moon and go after Khan on the now repaired Enterprise and Horner gives us back the rousing Enterprise motif as the Enterprise and the Reliant set off for their Battle in the Mutara Nebula. There is very little of the back and forth typified by the first battle between these two ships, this time with very few exception we have the heroic march of The Enterprise sounding out to everyone in the audience that Kirk has the upper hand this time and Khan has no way of besting the Admiral this time. There is however something unique in this piece, just underneath the elegiac Enterprise theme is a single thrumming violin playing the same note again and again and again – a musical ticking clock countdown that guides us through the battle, halting only in a few moments that place the audience on the edge of their seat. Kirk and crew fire off their weapons and cripple Khan’s ship with great fanfare, surely that ticking clock must now come to an end? It doesn’t, it gets louder. Beaten but not defeated, Khan activates the Genesis device in his final defiant act against Kirk. The Enterprise is crippled and there is no way that she can escape in time, the aural landscape that formed Khan’s chaotic motif now reshapes itself around the repeated string note – Khan has now become the Genesis countdown – crying out that Kirk and his vessel have only moments to live. In the first action set piece we had the back and forth between Kirk’s motif and Khan’s with a countdown clock between them, in this final battle piece Horner reverses that concept. Now Khan’s motif has become the countdown and Horner dances between Kirk’s motif as he waits on the bridge of the Enterprise and Spock’s motif as the logical Vulcan goes to the engine room to sacrifice himself that the Enterprise will survive. Kirk and the bridge crew sit and wait to die, then Spock presses the right buttons – does what only he can do. The countdown motif drops out completely, giving way to Spock’s motif alone and then a triumphant resurgence of The Enterprise motif. Success, the engines are back online and the Enterprise warps away. Horner returns us to the mysterious Genesis motif as Kirk and crew congratulate themselves, the repeated strings get more forceful and more urgent but there is still a sense that there is something missing. Finally Horner reveals what is missing, and as Kirk realizes that Spock has sacrificed himself for the good of the crew we hear for the first time that Spock’s motif and the Genesis motif complement each other just as Kirk’s motif and the Enterprise motif had. Spock and Kirk have a final moment as Spock with his now complete motif indulges himself in an emotional goodbye before he dies. Spock gives the famous Vulcan salute to Kirk and Horner restates with full bombastic color the Alexander Courage Star Trek The Original Series motif as a final send off to the noble Vulcan before he slumps down – a mournful and slow restatement of the Kirk motif lingering to express the sadness that Kirk himself cannot. In the final moments Horner orchestrates a beautiful version of Amazing Grace that begins with Bagpipes that transition to a warm and vibrantly hopeful version of the classic with full orchestra as Spock’s burial torpedo is launched toward the newly formed Genesis Planet. Briefly the Genesis mystery motif and the Spock motif are restated with great and gorgeous fanfare before the End Titles begin with Leonard Nimoy delivering the classic “Space, the final frontier…” intro from the original series overtop another lush re-orchestration of the classic theme – and if you’re a Star Trek fan and you think this particular orchestration during the final moments sounds very familiar it is because the Horner orchestration here is duplicated in the opening moments of the Star Trek: The Next Generation theme as Patrick Stewart delivers his iteration of the “Final Frontier” speech. James Horner composed the score to Star Trek II in 1982 and kicked open the door to a career filled scoring amazing films like Field of Dreams, Braveheart, Apollo 13, Titanic and Avatar. In a 2009 interview with the LA Times Mr. Horner said “My job … is to make sure at every turn of the film it’s something the audience can feel with their heart. When we lose a character, when somebody loses, when someone disappears – at all times I’m keeping track, constantly, of what the heart is supposed to be feeling.” That scoring ethos is very clearly on display in the score for Wrath of Khan, and it creates a potent and visceral film experience. Some film scores restate the story of the movie in their own way, some film scores tell their own narrative that is beautiful and complete even without the film itself, and then there is a score like this one where the musical beats are so dialed in to the story beats of the movie that listening to the score almost gives you instant recall of the movie in your mind. For me, the score for Wrath of Khan is a moving experience that I can embark on separately from watching the film and walk away having had the exact same emotional experience. 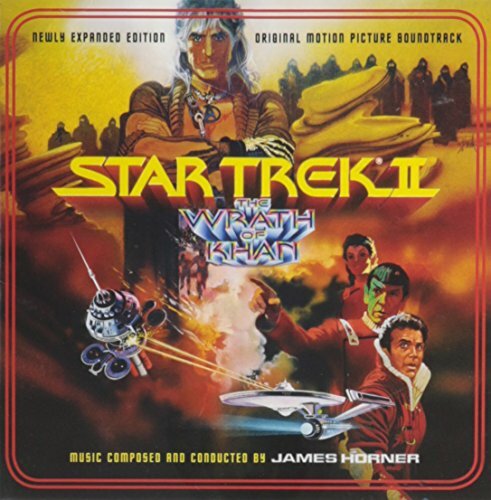 Star Trek II remains the very best of the Star Trek films to date, and James Horner’s score remains the very best of the series scores as well. Thank you for joining us for this in depth look at the score for Star Trek II, if you have a favorite score you’d like us to talk about let us know in the comments below.